Road Trip, originally uploaded by downtothewiredesigns. It’s been a while since I sat down and blogged here but between two computers breaking down, needing a break myself and just being busy, this blog got put aside. Then a few days ago a friend who is a potter went to refer one of her friends to this blog and realised I hadn’t been doing it for a while. So thanks to Bridget I’m back. 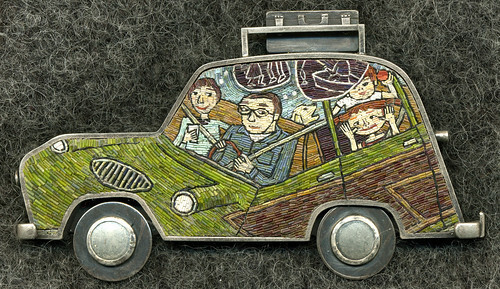 This wonderful car brooch is a piece called Road Trip and is a collaboration between Chuck Domitrovich who did the metal work and Cynthia Toops, a polymer artist. The piece is only 3.75 inches long by 2.125 inches tall so that is a lot of very small threads and patience. 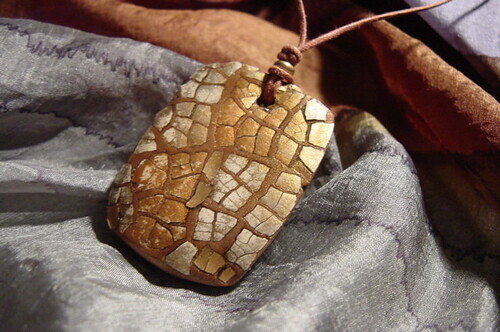 Her work includes the use of polymer clay amongst other materials. She holds classes and workshops so check out the website. Eggshell mosaic, originally uploaded by adriana delphino. And beautifully shows the rest of us how it is done with lots of photos. Tina then goes on to make these tiles into a coaster. A fantastic tutorial. HGTV have done it again with this Lisa Pavelka designed mosaic book project. It involves making mini-tiles from polymer clay and then making a mosaic directly onto the book.